Darrell Waltrip is in the NASCAR hall of fame for good reason. He has raced in nearly 100 races in his career, including 22 top 5 finishes, a modern NASCAR record, including track records from multiple tracks, and having won the Coca Cola 660 a record five times. It wasn’t until 1983 that Waltrip put his trust in Christ, however it would be another decade or so before he began to feel convicted about not putting God first in his life (Matt 6:33). That’s when he began to look at the needs of others as being more important than his own. God had blessed him greatly and now he decided he’d spend the rest of his life trying to serve God, by serving others. He came up with the idea of Motor Racing Outreach (MRO), where he could provide prayer and spiritual support for the racers and their families, all of which must live with the fear of tragedy. Today, Waltrip does expert analysis on national broadcasts of NASCAR racing events and has even written a book about his life’s experiences. Kyle Eugene Petty is the son of the famous hall of famer, Richard Petty, who for so many, is a legend as big as the late Dale Earnhardt, who was killed in a freak accident during the final lap of the Daytona 500 in February, 2001. Drivers live with this kind of threat every time the climb into the car. Life is fragile, but even in the safest cars there are, they are all just one split second from eternity. Petty realized that even though he’d been going to church all his life, he felt like he was just “going through the motions.” Something was missing. After his uncle was killed in a pit road accident, he realized that if racing was going to be his life, he needed the sovereign hand of God in his life. He turned his life over to the Lord and said that unless you build your house on the Rock (Jesus Christ), it’s going to fall and fall hard. Dale Jarrett grew up in church but he says it just didn’t stick with him. His mind was consumed with racing and had it in his blood as he used to attend his father’s (Ned Jarrett) races that took place in the Southeastern United States. His rejection of God changed when he started driving for Joe Gibbs. Anyone that knows about Joe Gibbs knows that he as strong of a Christian that there is. He goes public with his faith, praying often, studying the Bible and attending worship services when he’s able. For Dale Jarrett, his faith got him through one of the deepest sorrows in his life when his close friend and fellow driver, Dale Earnhardt died in a racing accident in 2001. He credits his faith in God that he was able to continue racing. Bobby Labonte, even as a young boy, was seemingly always worried about the future (like many of us are) and he lived a life of trying to please everyone which is impossible, because you can’t please everyone. He became discouraged over this when he read and finally understood what a Bible verse said. He read Matthew 6:34 where Jesus said, “Therefore do not be anxious about tomorrow, for tomorrow will be anxious for itself. Sufficient for the day is its own trouble.” That’s what he wanted, instead of worrying over things he had no control over. When we turn our lives over to God, we should say, “Here are the keys God, you drive.” That’s just what Bobby Labonte did. He gave God the car keys and said, “You drive” and even though he’s behind the wheel, he understands that God’s the one directing the car. Chris “Hacksaw” Martin, like many of the drivers above, grew up in church. He thought he believed in Jesus and in the Bible but he found out that, he wasn’t actually saved. He heard so much of the preaching and Bible teaching that he took Jesus for granted. He says, I didn’t need God, I’m self-sufficient and his mood matched his stubbornness….until suddenly, he ended up in the hospital, know knowing whether he’d live or die. He started to pray and then read Matthew 6:33, where Jesus said, “But seek first the kingdom of God and his righteousness, and all these things will be added to you” and that gave him peace. It was “the peace of God, which surpasses all understanding, will guard your hearts and your minds in Christ Jesus” (Phil 4:7). Jeff Gordon is one thankful man. He recognizes that God has blessed him, acknowledging that his daughter is a precious gift from God. For Gordon, his trust in Christ came very late in life, and he regrets that, but is thankful that he is now in the faith. Even though Gordon’s one of the all-time leading racers in NASCAR history, he realizes that life is so much more than winning or losing a race. The winning is in his relationship with God and says that he prays regularly and now, later in his life, he says God has a much more significant role than before. Jordan Anderson is one of the most public of NASCAR drivers when it comes to his faith. If you asked him to write a testimony, it would be about 5-6 pages long. He gives God so much credit for everything that you can’t help but love this man’s humility. One of the Bible verses that have impacted his life so much is 1st Timothy 1:12 where Paul writes to Timothy, “I thank him who has given me strength, Christ Jesus our Lord, because he judged me faithful, appointing me to his service.” Anderson takes this service personally, wanting to be a servant of Christ, a blessing to others, and a child of the King. That is part of what he is so thankful for. 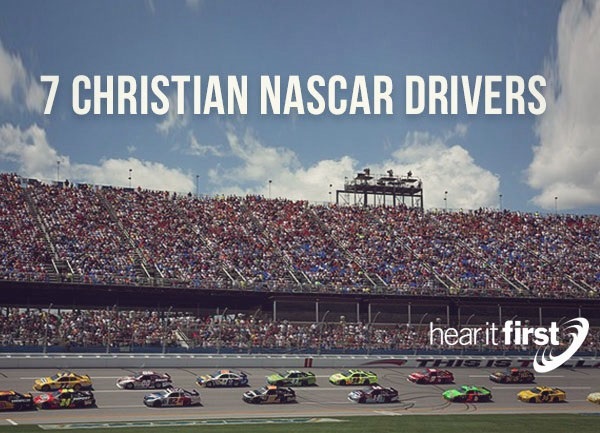 No matter which of these are your favorite drivers, they’ve all put their trust in Christ and that road leads to eternal life for all which God has brought to repentance and faith in Christ, are also a child of the King. They are a child of God and no matter what happens they believe their final lap in life leads into the kingdom of God. What about you? Do you know for sure where you are going (Rev 20:12-15 or Rev 21:1-5, 22:1-21)?